Oh this map brings back wonderful memories! 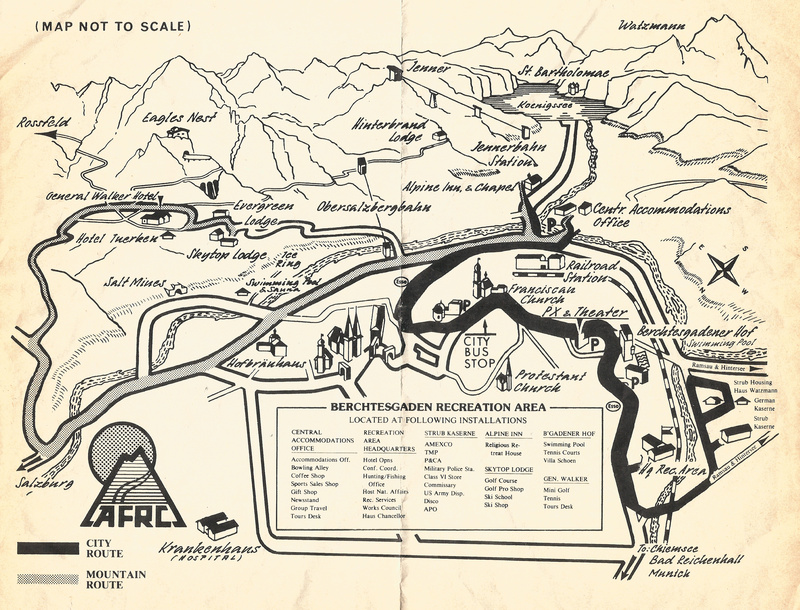 When Roberta and her brother and sister were cleaning out their mother’s house a few weeks ago they stumbled on this map tucked away into a souvenir booklet of the German region of Berchtesgaden. Their mother picked it up during a visit to Germany in the mid-1980’s when we and Roberta’s brother were stationed in Germany with the US Army. Bertchesgaden has a twisted history. First let me say that the region, nestled in the southeast corner of Germany right along the border with Austria (the city of Salsburg, made famous in The Sound of Music is just a few miles away) is drop-dead gorgeous, one of the most beautiful places on earth. The high Alpine allure of the Bertchesgaden/Obersalzberg region is undeniable. And that’s why one of history’s biggest monsters, Adolph Hitler, chose to live on the Obersalzberg just above Bertchesgaden. While he was an evil SOB it is undeniable that he had an eye for composition and landscape. In the early 1930’s, using royalties from the sales of his book ‘Mein Kampf’, Hitler bought and started expanding a small gasthaus (hotel) on the Obersalzberg, turning it into his official residence known as the ‘Berghof’ (mountain home). 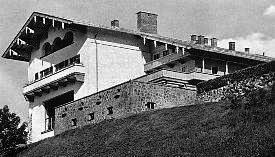 Very quickly the upper echelon of Nazi leadership followed, with Hermann Goering, Heinrich Himmler, Martin Bormann and even Hitler’s personal architect and later minister of armaments Albert Speer establishing residences on the mountain. But Roberta and I especially loved Berchtesgaden and all it offered. While the Garmisch recreation center focused on more intensive sports like skiing and climbing, Berchtesgaden was somewhat sedate and more family focused, perfect for a young couple with a new baby. But what drew me back to the Berchtesgaden AFRC time and again was the history of the place. The main hotel, the General Walker, was a former lodging center for high ranking Nazis and German officers who came to the Obersalzberg to confer with Hitler. When the Nazis owned it they called it the Platterhof, but when we rebuilt it and opened it as a hotel it was named after General Walton Walker, who had recently been killed leading American forces in the early stages of the Korean War. You could easily stroll from the General Walker to the houses or the ruins of houses of all the key Nazi leadership. The Obersalzberg mountainside was literally littered with Nazi history. The US Army rebuilt some of the structures for their own use, tore down others or just left the ruins in place. On one visit we arrived late to Berchtesgaden to find our room at the General Walker would not be available until the next day, so the hotel management billeted us for the night in what had been Albert Speer’s personal studio, shown in the map above as the Evergreen Lodge. I spent a good part of the night lying awake wondering just what sort of conversations had taken place within those walls as Speer first catered to Hitler’s outlandish architectural dreams and later as the Reich Minister of Armaments he charted the inevitable downfall of the German nation as depicted by the nation’s declining stocks of raw materials and her industrial facilities being pounded to rubble by Allied bombers. 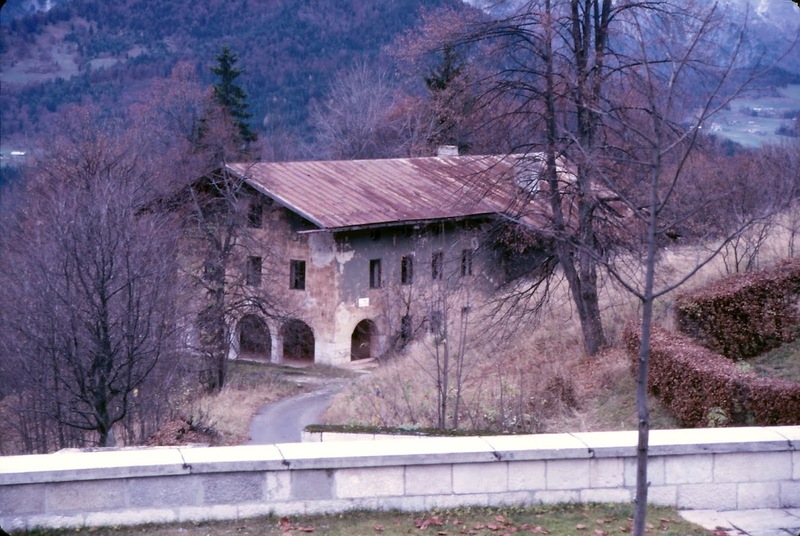 The Berghof was an expansive villa, more a compound than a house, and it served both as Hitler’s personal residence and a place where he conducted the business of state. Prior to Hitler’s invasion of Poland in 1938 and the opening of WWII, Hitler regularly hosted foreign leaders at the Berghof. Most came away impressed by the building and location but troubled by Hitler’s brand of international diplomacy. In poking around the ruins I found a piece of brick from the garage that had ‘fallen’ from the wall and ‘accidentally’ made its way into my camera bag. It sits on my mantle today as a unique reminder of a fascinating part of American and German history. Let’s fast forward a decade or two. In 1995, after the fall of the Soviet Union and troop reductions in Europe the US Army decided to close the Berchtesgaden AFRC and turn the Obersalzberg over to the Germans. We spent millions of dollars getting the facilities ready for the turn over. When we handed the keys to the Germans the facilities were in top-notch condition. Still, the Germans wanted nothing to do with the place and all the buildings stood empty for a few years, including the grand old General Walker. Then one year the Germans ‘forgot’ to winterize the plumbing and steam heat system in the hotel. During a particularly cold winter pipes froze and burst all over the hotel. The Germans declared the hotel uninhabitable, tore it down and turned the location into a parking lot. Fourty years of American memories unceremoniously knocked down and bulldozed away. I still have not forgiven the Germans. In addition to knocking down the General Walker the German government went after all the remaining ruins on the mountain, to include the last remnants of the Berghof. Any remaining ruins were completely bulldozed and the rubble hauled away. The Germans simply did not want any visible reminders of the Nazi era left on the mountain. The last remnant was the ruins of the old Gasthaus Hoher Goll. It had sat a neglected ruin for over 40 years, but the German government decided to renovate it and turn it into something of a museum that describes just what used to be on the Obersalzberg. Known as the Dokumentation Obersalzberg Museum, it showcases the history of the Obersalzberg from the time when Hitler arrived in the late 1920s to when the Americans left in 1995. So let’s wrap it up here. There’s a lot more I could talk about in regards to the Obersalzberg, in particular the extensive underground tunnel system the Nazis dug through the mountain to connect all the key residences and facilities. But that’s a topic for another day. Instead, let me leave you with a link to an excellent video produced by Ruiter Productions in Germany that shows how the Obersalzberg looks today in relation to the 1940s. For old Soldiers and their families who spent time at the Bertchesgaden AFRC it is a nostalgic look back at what was. This entry was posted in Army and tagged afrc, berchtesgaden by Brian Haren. Bookmark the permalink. An enjoyable description of the AFRC, where I spent a big chunk of two 30-day leaves in 1968 and ‘69. I was stationed in Stuttgart. My then-wife and I (and our newborn daughter in ‘69) stayed at the General Walker. Truly first-class in every way. Although neither of us was a skier, we used to get a kick out of riding the Jennerbahn cable car to the top, just for the view. 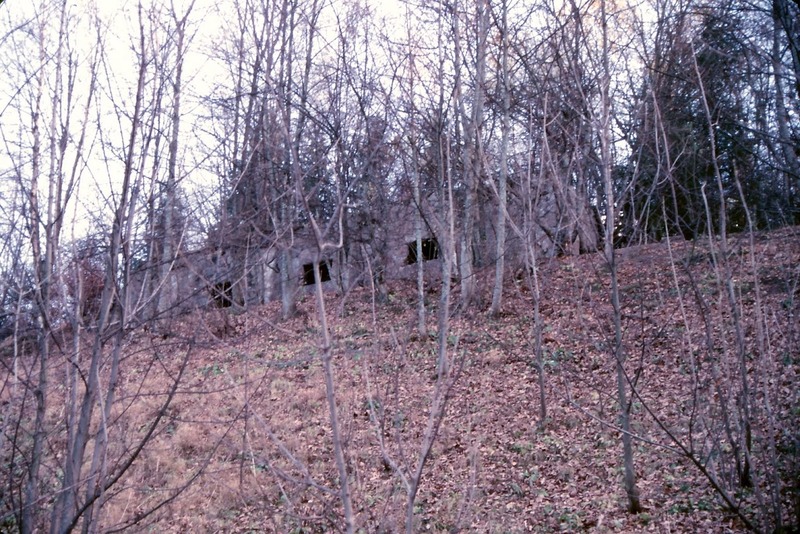 The remains of Hitler’s Berghof were still around—just foundation work and large stones, nothing to really see. The town of Berchtesgaden was—and I’m sure still is—a beautiful place to visit though, in ‘68 and ‘69, had older residents who were not very friendly. Their memories of WWII were still fresh. I know from friends who’ve been there recently that this has all changed. This is awesome. Brought back so many memories. Station in Kaiserslauten Germany. I was part of a group of food service soldiers to help with the over load of troops coming in for retreat. We actually lived in the barracks. Visited so many sites within the six months. Eagles nest was quite a trip but we managed. I spent my 1st day there across from the hotel in what was called the villa. Very spooky place. Lights on and off, baby cribs moving. Believe me 1 night. The barracks was quite spooky as well especially venturing on the top floors. I have rocks as well from Eagles Nest. Thank you for wonderful memories. This is a keep sake. Thank you! I was lucky to have been a ski instructor at AFRC Berchtesgaden 1975-1976, and also was at Garmisch-Partenkirchen and Chimsee for about two weeks each on the way to Berchtesgaden. Swimming in Bad Reichenhall, visiting crazy Ludwig’s castles, skiing Austria and Italy. Having a few beers at the Hobelbank Bierkeller. I think we were staying in the Skytop Lodge. We were told the ski area/golf course had been a demonstration farm. At the end of the ski season we had a ski jump into a pond. I then returned to Wildflecken, another beautiful part of German, at the very north part of Bavaria. Super memories, thanks! I fondly remember my days as a ski patroller during tdy at AFRC Berchtesgaden 1980-1981, and also at Chiemsee. A wonderful time in my life with the army. The “Slush Bowl”! Many made it out of the pond. I didn’t. Thanks for the memory, Mike. Those years in Berchtesgaden were the greatest. I was there with two friends in 1972 and will never forget that beautiful place .The restaurant was a magnificent place with old world charm. The view of Berchesgarden from the hotel was breath taking with all that snow . Excellent article on the history of the GW hotel. Recently recalled a ski week I spent there Dec ’74. Was wondering if it had survived the 80’s troop draw down and was hoping it might still be a functioning MWR facility that I might visit – sadly not in the cards. John, Would you be able to provide me any information or links to information on AFRC recreation programs during the 70s and 80s? Or could you suggest someone who might have information? I am looking for details on a “Blueberry Tour” that we made in 1974. Thanks! 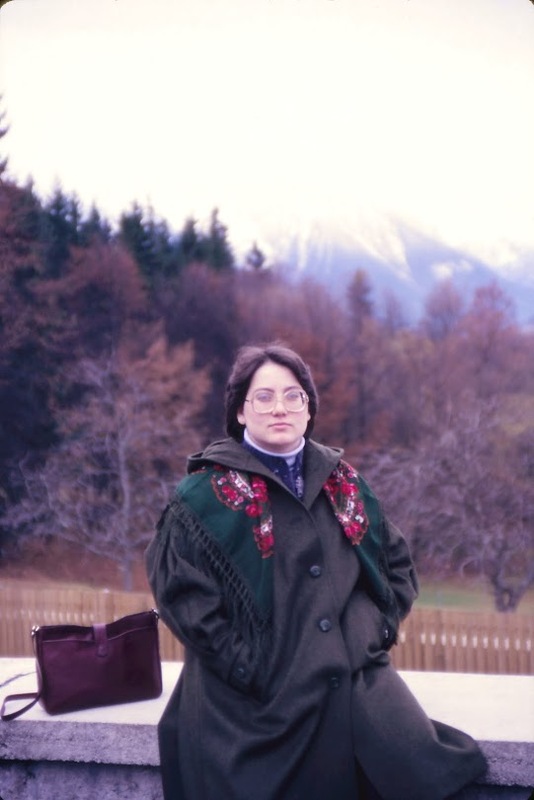 Elaine—we had so many programs it is hard to remember them all–ones I can remember are the ski packages from beginner to expert–these packages included equipment and instruction–we even had our own tour buses that would travel to the various military bases and furnish free transportation. Lake Chiemsee offered sailing,water skiing,and cross country skiing–we also had golf,tennis,kayaking.bowling, and various tours. Don*t know of any contact to get info although you might try AFRCSKI.com(a web site for former AFRC employees,especially ski instructors). Hope the info was helpful. Thank you for the article and photos. I was the AFRC deputy comptroller from 1973 to 1975 living in Garmisch but spent time at all the AFRC facilities in Berchtesgaden as well as those in Munich and Lake Chimsee. Elaine, I just stumbled across your message. I lived in Berchtesgaden from 1974 to 1976. My father was commander of AFRC Berchtesgaden during those years. He and I participated in the “Blueberry Tour” and remember it very well. Although I didn’t get to kayak (because I was only 12), I thoroughly enjoyed the hike and spending the night in that hut on the mountain. I also remember “skiing” down patches of snow in our boot on the way down to the hut and sampling my Dad’s Radler at the hut. Great times. Thank you so much for this article and pictures. I was stationed In West Germany, Bindlach, Delta FIST, 1st Squadron, 2 Armored Calvalry Regiment from summer of 82-summer of 84. I went to Berchesgarten both winters and stayed at the General Walker. I recall my leave in winter of 84 when I took the train from Bayreuth by myself all the way to Obersalzberg. What a great experience. One morning after a heavy snow, I decided to try to find the Eagles Nest. I got some general directions and started hiking up the mountain through the snow until I reached it. It was secured but I was able to take a few pictures and crawl over a barrier and stand on that rear deck and view the mountains. I am deeply saddened that the Walker Hotel was torn down. I have my opinions about why it was demolished but thats for another day. Thank you again – it meant much to me to relive those few moments again. A very nice article, well written, thank you. I stayed in the General Walker Hotel in 1982 for several days. I was led to believe that Hitler finished writing Mein Kampf in the basement or bottom floor of the General Walker, but was always skeptical of this assertion. Plus, was there a guest house for the high ranking SS officers near the General Walker location? 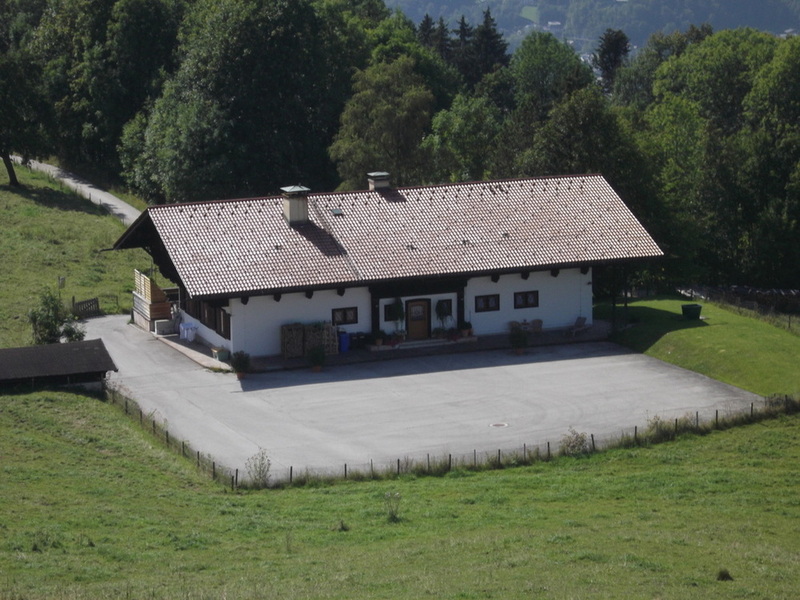 Carl, Hitler used the profits from the sale of “Mein Kampf” to buy the property that eventually became the Berghof, so I doubt he sat in the basement of the gasthaus that became the General Walker and finished the book. Hitler wrote Mein Kampf part II across the street up hill from the General Walker, at a tiny cottage called Kampfhauserl (missing an umlaut there). The hotel at the site of the General Walker was called the Pension Moritz at that time. The foundation of the outline of the cottage is still there, although tourists have been taking the remaining stones away. I was there in June 2017. Ruiter has a now and then showing how to get there. Hitler wrote some of Part 2 of Mein Kampf at a small wooden cabin back in the woods across the road from the Walker Hotel (then the Pension Moritz). The foundations are still there. Guest house for high ranking SS officers – you may be thinking of the Gaestehaus Hoher Goell, where the Dokumentation Obersalzberg museum is today. But it was mostly used for a few diplomatic guests, and for administrative offices. In the early 70s, I believe, my husband and I participated in an AFRC “Blueberry Tour.” We climbed a mountain, stayed in a mountain hut, and the next morning the group hiked (and briefly kayaked) down into Austria. We cannot remember which mountain we climbed. Do you have any information on this tour or know where I might find it? Thanks! Hi Elaine. I was station in Berchtesgaden ’83-84. I wasn’t part of AFRC but I believe you kayaked on the Konigssee and the mountain was probably the Watzmann Mtn. right to the east and within the Berchtesgaden National Park. I used to see folks doing this regularly. You probably didn’t kayak into Austria (wasn’t allowed and no direct water connection.) But Austria was VERY close. AFRC had bus rides to Salzburg on a regular basis too. IF, you were instead in Garmisch-Partenkirchen, you probably climbed the Zugspitze and paddled the Eibsee. Also very beautiful and right next to Austria. If you remember the kayaking with LOTS of people, it might well have been Eibsee. Hope this jogs the memories a bit… it did for me! Thanx for sharing our video of Obersalzberg Now & Then 1933-1945. Would you be so kind to change the URL? Thanx in advance. Jeroen, thank you for the update and the blog post has been updated with the new link. An excellent video, by the way! Watching the video brought back MANY MEMORIES.It is sad that they destroyed the General Walker, I stayed there on many times.1978/79-83. While as a dependent, I the military, I’d travel to Berchtesgaden about one a yr+ for a convention..I enjoy the surrounding area and took many of the historical sights, being a WWII “buff” it was very enlightening to be among the history of that place. That step hill with the hairpin curves up to the Keihlhase was interesting to say the least. An Excellent video that brings back the memories. I never made it to the AFRC Berchtesgaden on my first or second tour of Germany. I did make it while on leave from Ft. Sam Houston, TX back in 1990. I’m glad I made it before it was gone. We were book into the General Walker but when we arrived we found out we were overbooked and sent to the Pension Belvedere in town. What an upgrade. A two room suite on the top floor overlooking the town. Best week ever. While there we had the opportunity to use the facilities at the Walker, when gave time to explore the few remaining ruins left in the woods. Even then, tunnel rats had little holes and tunnels dug in the woods all around the Berghof trying to find souvenirs. I still have a small piece of ceramic tile I picked up from one of the dirt heaps. Interesting times. My one regret from my Army service is that I was never assigned to duty in Germany. I certainly would have been here often!